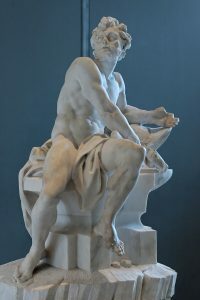 Cronus was the god of time in its sense of eternal duration. He married Rhea, daughter of Uranus and Gaea, a very important divinity. Their children were, three sons: Aïdes (Pluto), Poseidon (Neptune), Zeus (Jupiter), and three daughters: Hestia (Vesta), Demeter (Ceres), and Hera (Juno). Cronus, having an uneasy conscience, was afraid that his children might one day rise up against his authority, and thus verify the prediction of his father Uranus. In order, therefore, to render the prophecy impossible of fulfilment, Cronus swallowed each child as soon as it was born, greatly to the sorrow and indignation of his wife Rhea. When it came to Zeus, the sixth and last, Rhea resolved to try and save this one child at least, to love and cherish, and appealed to her parents, Uranus and Gaea, for counsel and assistance. By their advice she wrapped a stone in baby-clothes, and Cronus, in eager haste, swallowed it, without noticing the deception. The child thus saved, eventually, as we shall see, dethroned his father Cronus, became supreme god in his stead, and was universally venerated as the great national god of the Greeks. 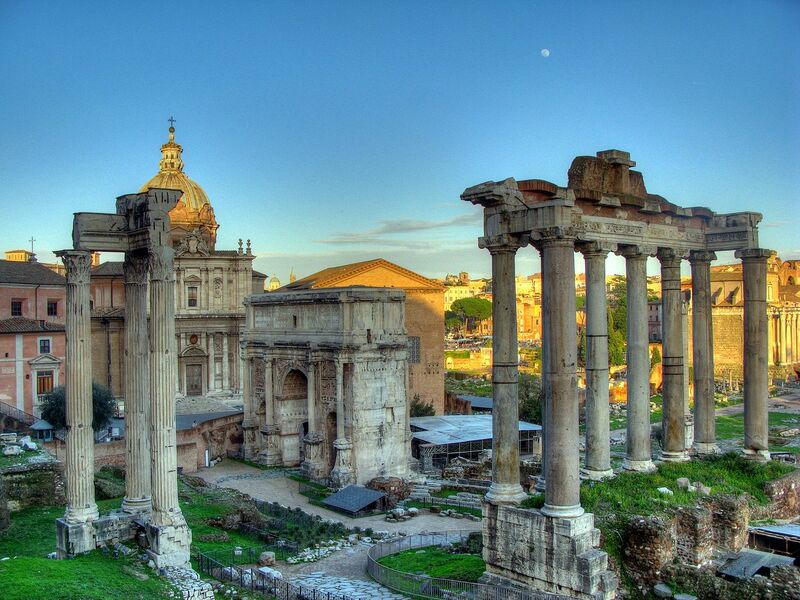 The Romans, according to their custom of identifying their deities with those of the Greek gods whose attributes were similar to their own, declared Cronus to be identical with their old agricultural divinity Saturn. They believed that after his defeat in the Titanomachia and his banishment from his dominions by Zeus, he took refuge with Janus, king of Italy, who received the exiled deity with great kindness, and even shared his throne with him. Their united reign became so thoroughly peaceful and happy, and was distinguished by such uninterrupted prosperity, that it was called the Golden Age. The principal seat of her worship, which was always of a very riotous character, was at Crete. At her festivals, which took place at night, the wildest music of flutes, cymbals, and drums resounded, whilst joyful shouts and cries, accompanied by dancing and loud stamping of feet, filled the air. This divinity was introduced into Crete by its first colonists from Phrygia, in Asia Minor, in which country she was worshipped under the name of Cybele. The people of Crete adored her as the Great Mother, more especially in her signification as the sustainer of the vegetable world. Seeing, however, that year by year, as winter appears, all her glory vanishes, her flowers fade, and her trees become leafless, they poetically expressed this process of nature under the figure of a lost love. She was said to have been tenderly attached to a youth of remarkable beauty, named Atys, who, to her grief and indignation, proved faithless to her. He was about to unite himself to a nymph called Sagaris, when, in the midst of the wedding feast, the rage of the incensed goddess suddenly burst forth upon all present. A panic seized the assembled guests, and Atys, becoming afflicted with temporary madness, fled to the mountains and destroyed himself. Cybele, moved with sorrow and regret, instituted a yearly mourning for his loss, when her priests, the Corybantes, with their usual noisy accompaniments, marched into the mountains to seek the lost youth. Having discovered him they gave full vent to their ecstatic delight by indulging in the most violent gesticulations, dancing, shouting, and, at the same time, wounding and gashing themselves in a frightful manner. 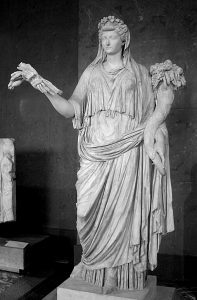 In Rome the Greek Rhea was identified with Ops, the goddess of plenty, the wife of Saturn, who had a variety of appellations. She was called Magna-Mater, Mater-Deorum, Berecynthia-Idea, and also Dindymene. 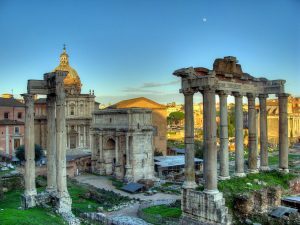 This latter title she acquired from three high mountains in Phrygia, whence she was brought to Rome as Cybele during the second Punic war, B.C. 205, in obedience to an injunction contained in the Sybilline books. She was represented as a matron crowned with towers, seated in a chariot drawn by lions. We will now return to Zeus and his brothers, who, having gained a complete victory over their enemies, began to consider how the world, which they had conquered, should be divided between them. 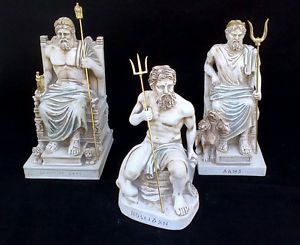 At last it was settled by lot that Zeus should reign supreme in Heaven, whilst Aïdes governed the Lower World, and Poseidon had full command over the Sea, but the supremacy of Zeus was recognized in all three kingdoms, in heaven, on earth (in which of course the sea was included), and under the earth. Zeus held his court on the top of Mount Olympus, whose summit was beyond the clouds; the dominions of Aïdes were the gloomy unknown regions below the earth; and Poseidon reigned over the sea. It will be seen that the realm of each of these gods was enveloped in mystery. Olympus was shrouded in mists, Hades was wrapt in gloomy darkness, and the sea was, and indeed still is, a source of wonder and deep interest. Hence we see that what to other nations were merely strange phenomena, served this poetical and imaginative people as a foundation upon which to build the wonderful stories of their mythology. The division of the world being now satisfactorily arranged, it would seem that all things ought to have gone on smoothly, but such was not the case. Trouble arose in an unlooked-for quarter. The Giants, those hideous monsters (some with legs formed of serpents) who had sprung from the earth and the blood of Uranus, declared war against the triumphant deities of Olympus, and a struggle ensued, which, in consequence of Gaea having made these children of hers invincible as long as they kept their feet on the ground, was wearisome and protracted. Their mother’s precaution, however, was rendered unavailing by pieces of rock being hurled upon them, which threw them down, and their feet being no longer placed firmly on their mother-earth, they were overcome, and this tedious war (which was called the Gigantomachia) at last came to an end. Among the most daring of these earth-born giants were Enceladus, Rhoetus, and the valiant Mimas, who, with youthful fire and energy, hurled against heaven great masses of rock and burning oak-trees, and defied the lightnings of Zeus. One of the most powerful monsters who opposed Zeus in this war was called Typhon or Typhoeus. He was the youngest son of Tartarus and Gaea, and had a hundred heads, with eyes which struck terror to the beholders, and awe-inspiring voices frightful to hear. This dreadful monster resolved to conquer both gods and men, but his plans were at length defeated by Zeus, who, after a violent encounter, succeeded in destroying him with a thunderbolt, but not before he had so terrified the gods that they had fled for refuge to Egypt, where they metamorphosed themselves into different animals and thus escaped. The first natural belief of the Greek people was that man had sprung from the earth. They saw the tender plants and flowers force their way through the ground in the early spring of the year after the frost of winter had disappeared, and so they naturally concluded that man must also have issued from the earth in a similar manner. Like the wild plants and flowers, he was supposed to have had no cultivation, and resembled in his habits the untamed beasts of the field, having no habitation except that which nature had provided in the holes of the rocks, and in the dense forests whose overarching boughs protected him from the inclemency of the weather. In the course of time these primitive human beings became tamed and civilized by the gods and heroes, who taught them to work in metals, to build houses, and other useful arts of civilization. But the human race became in the course of time so degenerate that the gods resolved to destroy all mankind by means of a flood; Deucalion (son of Prometheus) and his wife Pyrrha, being, on account of their piety, the only mortals saved. By the command of his father, Deucalion built a ship, in which he and his wife took refuge during the deluge, which lasted for nine days. When the waters abated the ship rested on Mount Othrys in Thessaly, or according to some on Mount Parnassus. Deucalion and his wife now consulted the oracle of Themis as to how the human race might be restored. The answer was, that they were to cover their heads, and throw the bones of their mother behind them. For some time they were perplexed as to the meaning of the oracular command, but at length both agreed that by the bones of their mother were meant the stones of the earth. They accordingly took up stones from the mountain side and cast them over their shoulders. 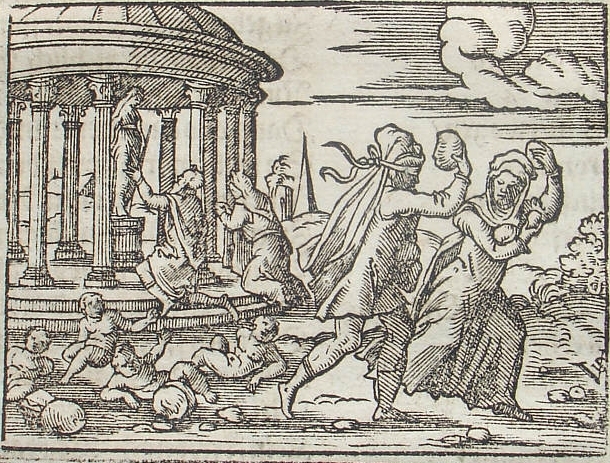 From those thrown by Deucalion there sprang up men, and from those thrown by Pyrrha, women. After the lapse of time the theory of Autochthony (from autos, self, and chthon, earth) was laid aside. When this belief existed there were no religious teachers whatever; but in course of time temples were raised in honour of the different gods, and priests appointed to offer sacrifices to them and conduct their worship. These priests were looked upon as authorities in all religious matters, and the doctrine they taught was, that man had been created by the gods, and that there had been several successive ages of men, which were called the Golden, Silver, Brazen, and Iron Ages. Life in the Golden Age was one unceasing round of ever-recurring pleasures unmarred by sorrow or care. The favoured mortals living at this happy time led pure and joyous lives, thinking no evil, and doing no wrong. The earth brought forth fruits and flowers without toil or labour in plentiful luxuriance, and war was unknown. This delightful and god-like existence lasted for hundreds of years, and when at length life on earth was ended, death laid his hand so gently upon them that they passed painlessly away in a happy dream, and continued their existence as ministering spirits in Hades, watching over and protecting those they had loved and left behind on earth. The men of the Silver Age were a long time growing up, and during their childhood, which lasted a hundred years, they suffered from ill-health and extreme debility. When they at last became men they lived but a short time, for they would not abstain from mutual injury, nor pay the service due to the gods, and were therefore banished to Hades. There, unlike the beings of the Golden Age, they exercised no beneficent supervision over the dear ones left behind, but wandered about as restless spirits, always sighing for the lost pleasures they had enjoyed in life. The men of the Brazen Age were quite a different race of beings, being as strong and powerful as those of the Silver Age were weak and enervated. Everything which surrounded them was of brass; their arms, their tools, their dwellings, and all that they made. Their characters seem to have resembled the metal in which they delighted; their minds and hearts were hard, obdurate, and cruel. They led a life of strife and contention, introduced into the world, which had hitherto known nothing but peace and tranquillity, the scourge of war, and were in fact only happy when fighting and quarrelling with each other. Hitherto Themis, the goddess of Justice, had been living among mankind, but becoming disheartened at their evil doings, she abandoned the earth, and winged her flight back to heaven. At last the gods became so tired of their evil deeds and continual dissensions, that they removed them from the face of the earth, and sent them down to Hades to share the fate of their predecessors. We now come to the men of the Iron Age. The earth, no longer teeming with fruitfulness, only yielded her increase after much toil and labour. The goddess of Justice having abandoned mankind, no influence remained sufficiently powerful to preserve them from every kind of wickedness and sin. 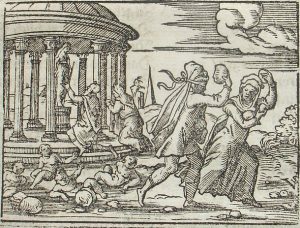 This condition grew worse as time went on, until at last Zeus in his anger let loose the water-courses from above, and drowned every individual of this evil race, except Deucalion and Pyrrha. 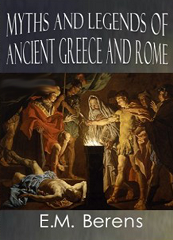 Zeus, pretending to be deceived, chose the heap of bones, but he saw through the stratagem, and was so angry at the deception practised on him by Prometheus that he avenged himself by refusing to mortals the gift of fire. Prometheus, however, resolved to brave the anger of the great ruler of Olympus, and to obtain from heaven the vital spark so necessary for the further progress and comfort of the human race. He accordingly contrived to steal some sparks from the chariot of the sun, which he conveyed to earth hidden in a hollow tube. Furious at being again outwitted, Zeus determined to be revenged first on mankind, and then on Prometheus. To punish the former he commanded Hephaestus (Vulcan) to mould a beautiful woman out of clay, and determined that through her instrumentality trouble and misery should be brought into the world. The gods were so charmed with the graceful and artistic creation of Hephaestus, that they all determined to endow her with some special gift. 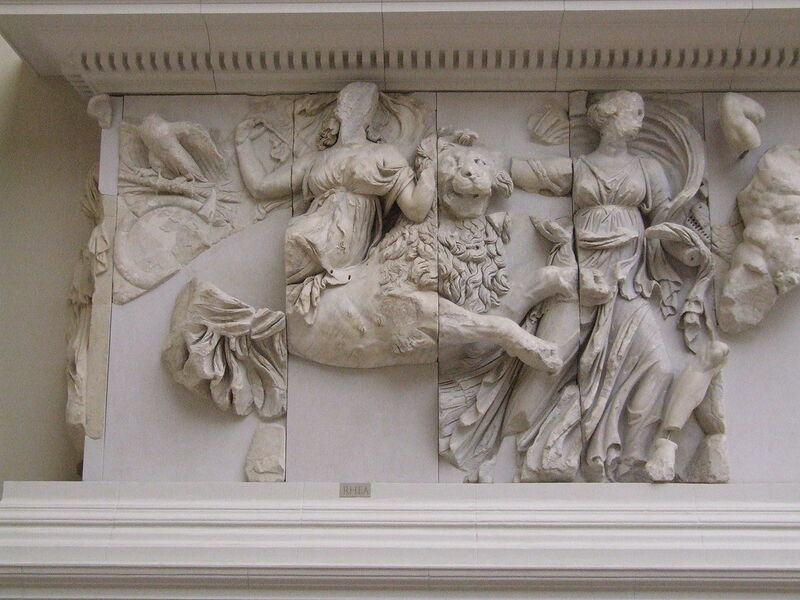 Hermes (Mercury) bestowed on her a smooth persuasive tongue, Aphrodite gave her beauty and the art of pleasing; the Graces made her fascinating, and Athene (Minerva) gifted her with the possession of feminine accomplishments. She was called Pandora, which means all-gifted, having received every attribute necessary to make her charming and irresistible. Thus beautifully formed and endowed, this exquisite creature, attired by the Graces, and crowned with flowers by the Seasons, was conducted to the house of Epimetheus by Hermes the messenger of the gods. Now Epimetheus had been warned by his brother not to accept any gift whatever from the gods; but he was so fascinated by the beautiful being who suddenly appeared before him, that he welcomed her to his home, and made her his wife. It was not long, however, before he had cause to regret his weakness. From The Myths and Legends of Ancient Greece and Rome, by E.M. Berens (CreateSpace, 05.21.2014), published by Erenow, public open access.